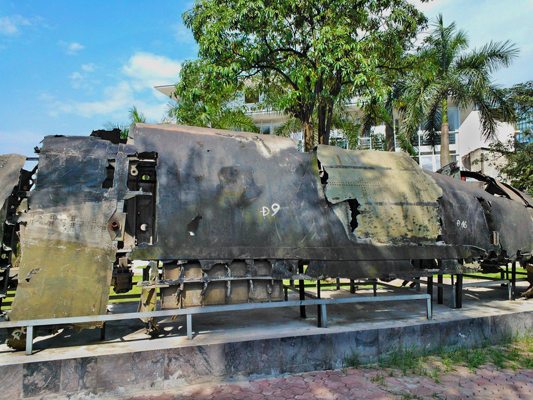 Many web search hits bring the reader to what is erroneously called “The B-52 Museum” in Hanoi — or to the location where a fallen B-52 sits in a neighborhood pond which is an outdated description. 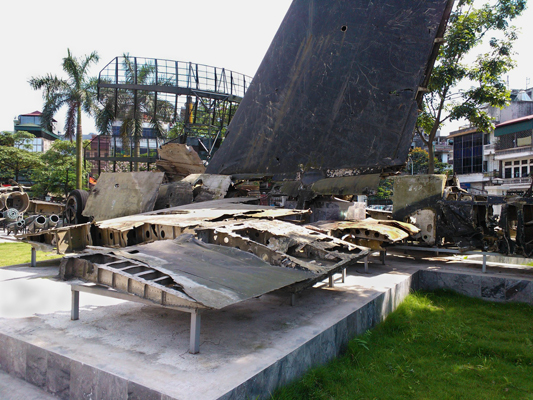 The simple answer is that a B-52 Stratofortress was shot down during the first evening of Operation Linebacker II, 18 December 1972, and Vietnam has erected a museum very near the crash site — the Ba Đình neighborhood of Hanoi (Hà Nội) — and it is named the Museum of Victory over B-52 (Bảo Tàng Chiến Thắng B.52). 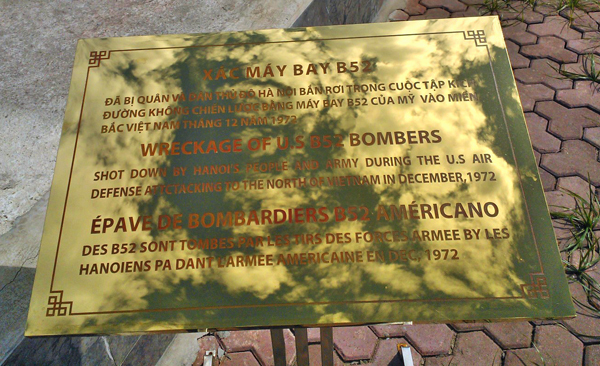 The B-52 wreckage has been removed from the pond formerly named Huu Tiep Lake but is now called B-52 Lake (May Bay B52). 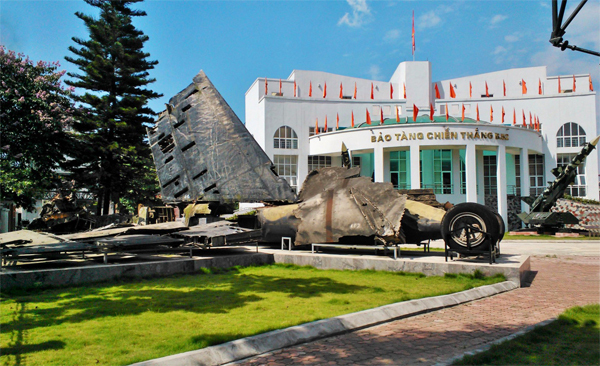 There is more at the museum, as well, with descriptions and displays of the aerial combat that has occurred in Vietnam’s History — especially the antiaircraft artillery since that has been of special interest to this country which did not have air superiority in its wars against the French as well as the United States. 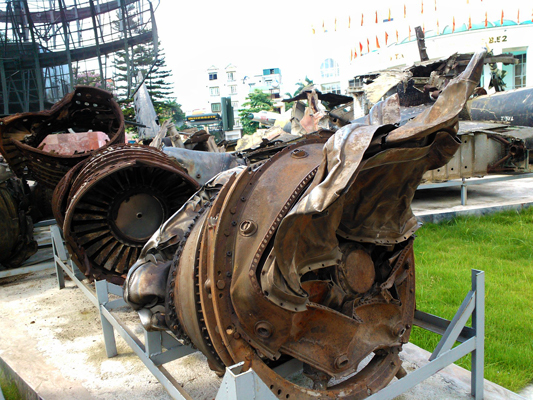 The official Vietnamese viewpoint that the downing of 15 Boeing B-52 Stratofortresses (using the B-52 as a metaphor for the power of the United States) was tantamount to the Vietnamese victory at Battle of Dien Bien Phu (Điện Biên Phủ). A propaganda victory as opposed to a military one — the cost of bringing the B-52 heavy bombers was quite high and left the North Vietnamese forces nearly devoid of SA 2 Guideline surface-to-air missiles — many were launched in desperate salvos as the radar guidance was effectively negated. Yet, a city populace which was on the receiving end of these bombing raids would feel vindication with so many of these large aircraft never returning home. The official view of the United States in that the Paris Peace Talks were unproductive and a strategy was needed to provide inspiration for North Vietnam to take a more serious negotiation stance. Operation Linebacker II accomplished this but with planning errors: waves of B-52 aircraft arriving on target from the same direction and altitude (especially on the first evening) giving the North Vietnamese air defenses a sense of predictability; too much time between each wave giving the North Vietnamese enough time to assemble SA 2 Guideline missiles and deliver them to their launching sites; premature turns once the ordinance was dropped (this is where the B-52’s defense system made them vulnerable as their antennae directed their emissions vertically downward). 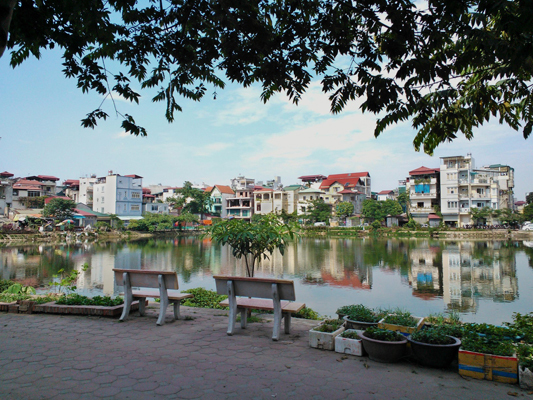 A personal view, that of the B-52D (aircraft number 56-0608) with the call sign “Rose 01” which is the aircraft that crashed into the small water body in the neighborhood of Ba Đình in Hanoi due to a SAM missile hit. Two of the crewmen were killed as a result of the missile strike with the remaining four captured (released 101 days later). 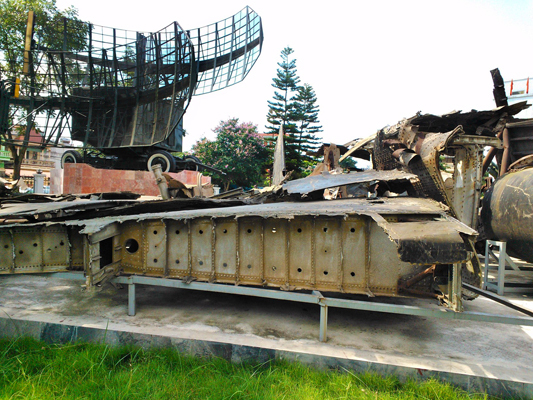 The wreckage stands as a memorial to their courage for maintaining formation in the three-plane cell of their wave as it was the cell which provided the best protection against the missiles ascending to intercept them. Our thanks to Catherine Dowman for these images and the exploration of this museum during an incredibly hot and humid day. 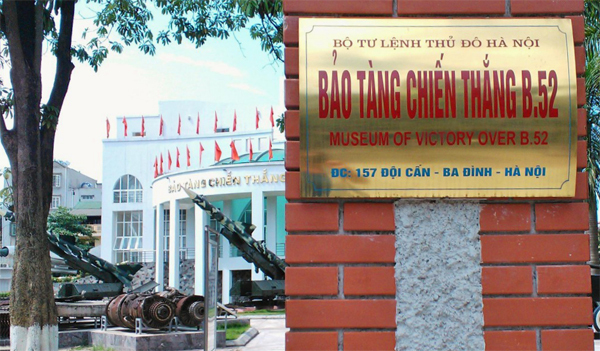 The museum is located near the address of 157 Đội Cấn in the Ba Dinh District of Hanoi, Vietnam is the Museum of Victory over B-52 — Bảo Tàng Chiến Thắng B.52 when spoken in Vietnamese. Two more posts will publish subsequently to complete this museum’s review. Note: our thanks to James S. (Steve) Creech for noting an error in the text as well as Brian Barrows for noting a second error (see their comments below). Wonderful! 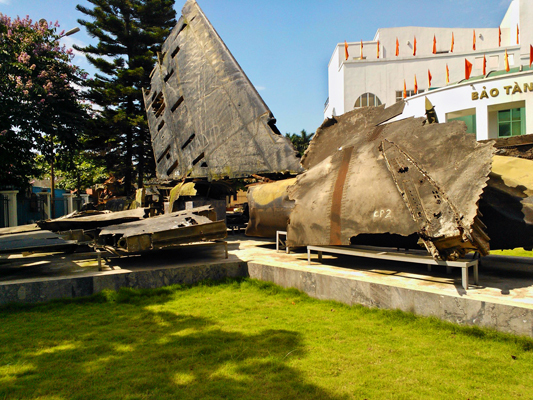 I have been wishing to go an Aircraft kind of Museum it is indeed great. The photos are very good. Love it so much. Nice write-up, just to note that there is a lake/pond with a small piece of aircraft wreckage in it near the museum (still there, at least as of a couple weeks ago), but it is a few hundred meters to the north back some neighborhood alleys, not the same place as the lake right behind the museum. Thank you for these pictures and the write up. This one is quite personal to me because my father was the Electronic Warfare Officer on “Rose 1” so I find myself often looking at pictures of his crash site. I had not realized that there was as much of the aircraft at the museum until I saw your page. Just as a quick detail, the four POWs were released about four months later (not fifteen) on March 29, 1973. Again, thank you for the pictures! Thank you for your comment, compliment and correction. I regret the error and have amended it with many thanks. I’m also humbled my post was of some use for you. Jim Poole here, i have lost contact with your family. My dad was the gunner. Reach out to me. The best bet is to email me at bcbarrows@yahoo.com. Glad to talk to you again! Just read your review today, great post with lots of relevant information to the museum. 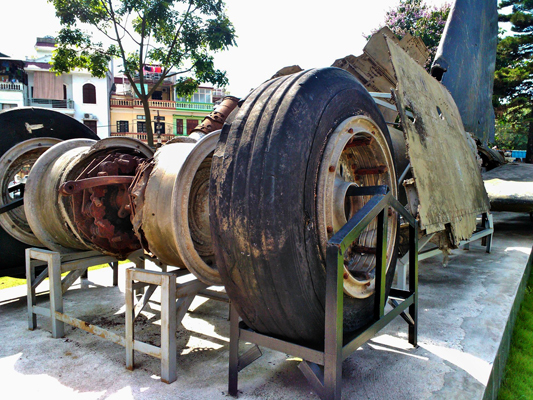 I was in Hanoi a few months, I went the B-52 victory museum and the B-52 lake. 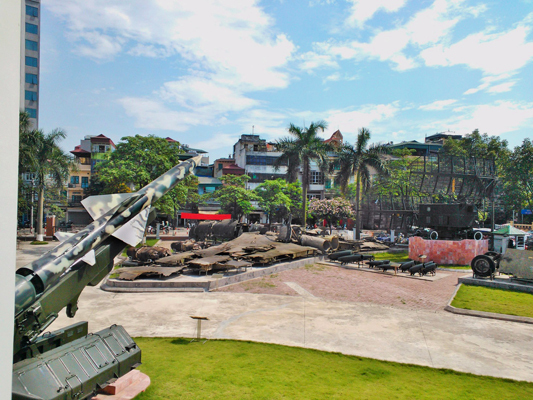 I started a blog a last month, this is my review http://thetravellingphase.com/b-52-victory-museum-hanoi/ and I added a link to my post from this post. 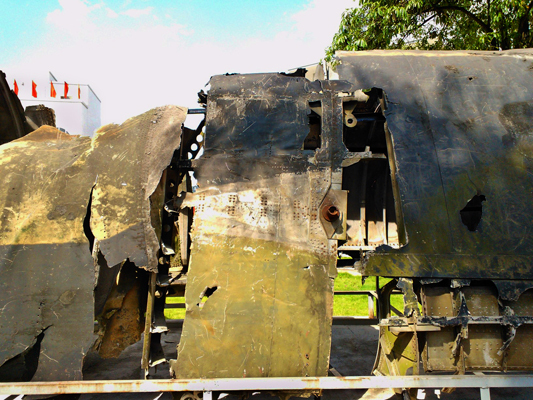 The B-52 in the pond, was shot down 27-12-1972, so it cannot be Rose 01 which, as you set out, fell on 18 Dec. Thanks. This has gone back and forth. The date you gave will help me to sort to out. Thanks again. B-52 Victory Museum Hanoi, Vietnam.